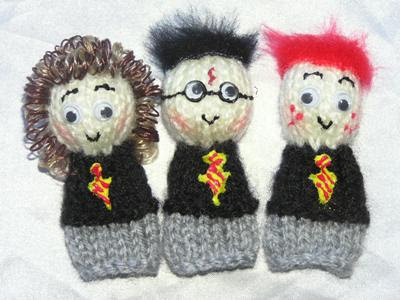 Hand knitted in acrylic wool they are perfect for toddlers pretend play, and Harry Potter and his friends are so cool! There are three puppets in this set, Harry Potter and his 2 friends, Hermione Granger and Ron Weasley. They are just the right size for tiny little fingers with joggle eyes and hair attached, not knitted in, to give them a more real appearance. Shout out about New Zealand Handmade on Facebook -make sure you tag the post to let us know you shouted! You can get 1 entry for each of the above, for a grand total of 5 entries! Entries close August 1st, Sunday 12 noon, New Zealand time. The drawing will take place and the winner announced on Sunday night! So get clicking and typing so you can have a chance at these crafty finger puppets. Oooh I love these little guys! I just started following her blog! Love these finger puppets! I'm a big fan of Harry Potter. Your giveaways are too cute and adorable. I wish I had joined your little contest. Unfortunately, it's already too late for that. Looking forward for another set of freebies though.